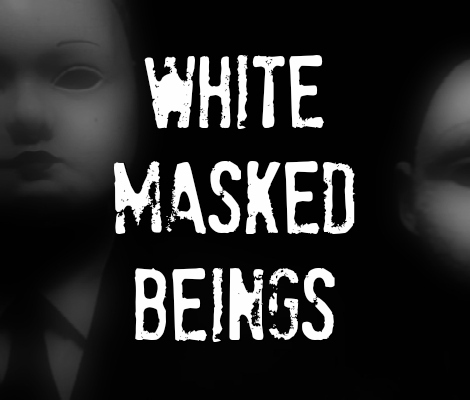 “When I heard you say beings in white masks my heart stopped. I saw them outside of my house. I lived in the piney woods of East Texas. As soon as I saw them, I just intuitively knew that I wasn't supposed to have been able to see them, it's like I heard their thoughts. The weirdest thing is how they tried to, I guess, trick me into thinking I hadn't seen them at all, like the way they moved away from me...not of this world. Like, I could see them getting further away from me, but I never saw the actual movements. I know that doesn't even make sense to our understanding but that's the best way I can describe it. Also, the faces of them contorted into crazy looking smiles and grimaces so I don't know if that's really a mask but that's what I thought I saw at first, too. I saw them a few different occasions; once I looked out my bedroom window and there were three sitting in a triangle formation peering up at me. I was shocked but calm at the same time, threw them a peace sign, and never looked out the window again. I really believe what she says, they are real. I think they're demons." Rae from RST Reservation, SD - MASKED APPARITIONS: This one is from my mother's experience. We lived in the apartment complex just off by a big field. She had explained that a bad car accident had happened across the field as there is a dirt road for a cut across into town. Both vehicles hit head on, one had 4 passengers and the other had 3. Nobody survived the accident. Well my mom goes on about how she was up late keeping an eye out as she was part of the neighborhood watch. She said she remembers seeing 3 people walk in from the field, all wearing black, but looked as if they had white masks on. She called her friend who was security, he had gone out, but reported he didn't see anyone. My mom explained how they kept appearing but before security could arrive, they would be no where around. Finally one night, my mom had seen 4 people walk up, security was already around the corner, my mom sitting by the window watching in terror as to the fact that she was hollering at security that they were right there. Security guy was shining his flashlight but couldn't see no one. My mom said she hollered in fear because he was shining the light right on them and they were right in front of him. He swore he couldn't see no one and that my mom was probably seeing things. My grandma vouched that the apartment complex had been built on half an old cemetery and that half the residents had reported seeing or hearing things.